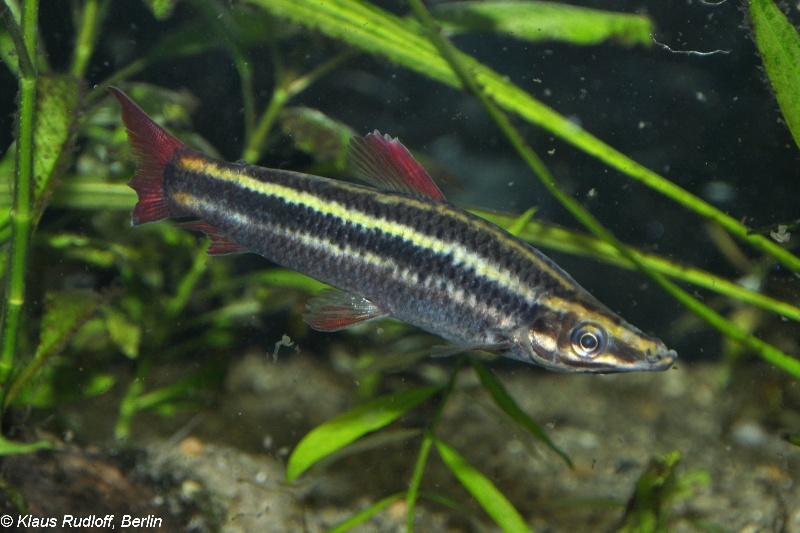 Young adult individual from the Danish aquarium trade. Wild-collected adult specimen witha degree of fin damage. Anostomus: from the Greek ana, meaning ‘up’, and stoma, meaning ‘mouth’ in reference to the upturned mouthparts in members of the genus. Type locality is given simply as ‘South America’ but this species is widespread throughout the Amazon and Orinoco river systems in Peru, Brazil, Venezuela and Guyana. Its typical habitat is along rocky shores of fast-flowing rivers, where it grazes algae and small invertebrates from the rock surfaces. An aquarium with base dimensions of 120 ∗ 30 cm or equivalent should be the smallest considered. A biotope-style set-up could consist of a sandy substrate, piles of smooth rocks and driftwood roots and branches, some of which should penetrate the water surface. Aquatic vegetation can be included if you wish but is likely to be eaten. Provide well-oxygenated water with a decent amount of movement and use bright lighting to encourage the growth of algae which will be grazed on by the fish. A well-fitting cover is essential as Anostomus spp. are excellent jumpers. This species is an omnivorous grazer browsing solid surfaces for algae, insect larvae and other small items in nature. In the aquarium it should be offered small live and frozen foods as well as plenty of vegetable matter in the form of blanched spinach, lettuce, cucumber, courgette, algae wafers, etc. Although it occurs in large shoals in nature, it tends to be very quarrelsome with conspecifics if only a few individuals are kept. It can be maintained in groups of 6 or more in larger tanks, but otherwise keep just a single specimen in a community of peaceful medium to large fishes. Possibilities include larger characids, loricariids, doradids and peaceful cichlids, with reophilic species particularly suitable. Mature females grow slightly larger and tend to be rounder-bellied than males. Information is very scarce. It’s apparently bred on a commercial basis in both South America and Asia. 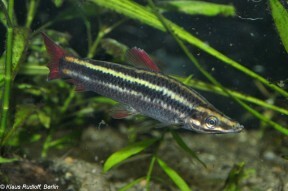 Anostomus currently contains five valid species though only A. anostomus and A. ternetzi are well-known in the aquarium hobby. A phylogentic study by Sidlauskas and Vari (2008) demonstrated the genus as recognised at the time to represent a polyphyletic lineage. Three species, A. intermedius, A. plicatus and A. spiloclistron, were found to be more closely-related to the genera Gnathodolus, Sartor and Synaptolaemus than to other congeners and therefore placed into the new genus Petulanos, with P. plicatus as type species. The family Anostomidae is distributed throughout much of tropical and subtropical South America from northwestern Colombia to central Argentina. The majority of species are moderately-elongate and somewhat rounded in shape although there are some exceptions, e.g., the relatively deep-bodied Abramites. Greater diversity is apparent in the range of oral morphology, however, and members exhibit a wide range of adaptations in dentition and jaw structure. A number of anostomids tend to swim at an oblique ‘head-down’ angle which has given rise to them being referred to by the generalised vernacular term ‘headstanders’. Phylogenetic relationships within the South American ﬁsh family Anostomidae (Teleostei, Ostariophysi, Characiformes).